Sharp’s agent Rick Curran of The Orr Hockey Group quickly shot down Wednesday any rumors of his client being shipped off by the Blackhawks this offseason. 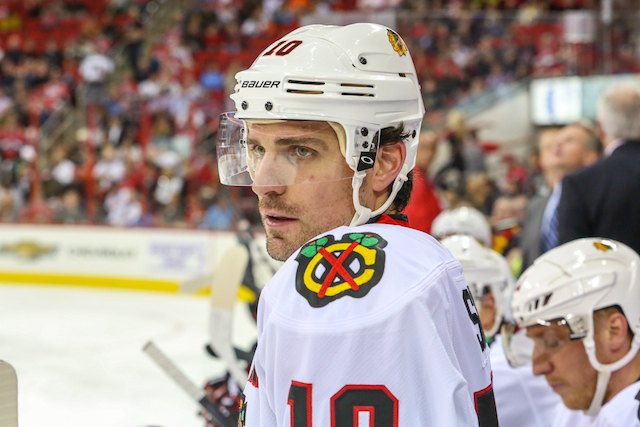 Curran said he was assured by Blackhawks general Stan Bowman that Sharp wasn’t going anywhere. “There’s absolutely no truth to it,” Currant said in a phone interview on Wednesday. “They’re not trading him. He’s the last guy on the list who they would trade. He’s not available. And seeing as how general managers and agents have never lied to one another before, I’m sure this puts the Patrick Sharp trade rumors to bed. Or it doesn’t, I don’t know. I’m not tuned in to what Stan Bowman’s true plans are with the roster this summer, but if the Hawks are going to make a move that breaks up the “core,” then Sharp is the most logical player to be moved. While Brent Seabrook has declined in recent years and has a cap hit of $5.8 million over the next two years, the Blackhawks really don’t have the depth on the blue line to absorb his loss. At least, not without making another move. The Blackhawks big need is at center, and if they’re going to make a move for one via trade, it makes more sense to move Sharp who is 32 and under contract for three more years. So while the Blackhawks may be telling Sharp’s agent that his client isn’t on the block, things can change with one phone call from the right team. This entry was posted in Chicago Blackhawks and tagged Brent Seabrook, Patrick Sharp, Trade Rumors by Tom Fornelli. Bookmark the permalink.